Estonia became a NATO member state on 29 March 2004. Estonia became a European Union member state on 1 May 2004. Estonia is a green land, forests cover 55% of the country. Estonia is a country of thousand of lakes, largest of these are Lake Peipsi and Lake Võrtsjärv. Highest point: Suur Munamägi (Great Egg Hill), 318 m.
The birth rate in 2013 was 10.3 per 1000 residents while the mortality rate reached 11.6 per 1000 residents. The capital of Estonia is Tallinn (432 thousand inhabitants or 32.8% of total population). From 1 January 2011 Estonia is member of euro zone and the currency in Estonia is euro. The official language is Estonian, which belongs to the Finno-Ugric language family and is closely related to Finnish. Along with Finnish, English, Russian and German are also widely spoken and understood. Compulsory school attendance in Estonia begins at the age of 7 and lasts until completion of basic education, which covers the grades 1-9 or up to the age of 17. Basic education is funded by the state budget and the local government. The principal objective of Estonia's educational system is to develop Estonian society into an open learning society, where every person is a lifelong learner. Since the Reformation movement in the 16th century, the Lutheran church has played the leading role in Estonia. Other larger active confessions are Russian Orthodox, Greek Orthodox, Baptist, Methodist and Roman Catholic. The Constitution of Estonia came into force in 1992 and is, in a number of ways, a compilation of aspects of Estonia’s previous constitutions. It has continued the democratic spirit of the 1920 Constitution, with some added mechanisms to maintain the balance of power of the state. Head of State: the President, who is elected by the parliament or an electoral body. Term: 5 years. Current President: Mr. Toomas Hendrik Ilves, elected by the Parliament on August 29, 2011. Next elections: Autumn 2016. The President has mainly representative functions, although he still retains a number of executive powers. The President may veto a parliamentary bill and have it sent back for revision, and his signature is required when appointing the Ministers of the Government. He is also empowered to present the parliament with the names of several higher officials. The President is also the supreme commander of the armed forces. National legislature: the Riigikogu, a unicameral parliament of 101 members, with a term of 4 years. Next elections for the 13th Riigikogu: March 2015. The executive power is exercised by the Government headed by the Prime Minister (currently Mr. Taavi Rõivas from Reform Party). The parliament is empowered to appoint and recall the Prime Minister. As a counterweight, the Government can dismiss the parliament, with the consent of the President, and call new elections if the parliament expresses no confidence in the Government. The court system is divided into three levels: courts of first instance (county and city courts and administrative courts), courts of appeal (circuit courts) and the Supreme Court which also functions as a constitutional court. The legal system is based primarily on the German model, especially within the field of civil law with which it has direct historical links. The courts are independent, judges are appointed for life and may not hold any other elected or appointed public offices. The Estonian legal system is subject to international law as well as European Union law. Consequently, general principles and norms of international law and directly applicable rules of European Union law form an integral part of national legal system. he Constitution provides for a national bank, independent of the Government, which operates as the bank of issue. It also provides for the office of the Chancellor of Justice whose task is also to be Ombudsman. The third office is that of the office of the Auditor General. The Governor of the central bank Eesti Pank, the Chancellor of Justice and the Auditor General are appointed by the parliament at the proposal of the President, but in their functioning they are independent government officials and cannot be dismissed by the parliament before serving a full term. The Constitution provides for two further types of government with a large degree of autonomy – local governments and cultural self-governments of ethnic minorities. Administrative division: 15 counties, 194 rural municipalities and 33 towns. Electoral systems: proportional representation. There is universal suffrage for Estonian citizens over 18 years of age. Municipal elections: Term: 4 years. All permanent residents over 18 years old, regardless of citizenship are eligible to vote in municipal elections. The last elections for local authorities were held on 20 October, 2013. Next local elections: October 2017. The Estonian coat-of-arms has ancient roots and resembles both that of Denmark and of England. 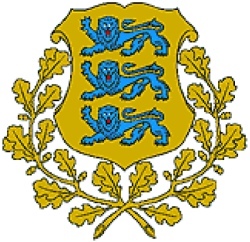 The three blue leopard-like creatures on a gold background were first used in 1219 as part of the coat-of-arms of the city of Tallinn and, later in history, of the Estonian province. In 1925, what is called the three-lion coat-of-arms finally became the national coat-of-arms. The origins of the Estonian flag lie within the national movement. In 1881, the Estonian Students’ Union adopted blue, black and white as the colours of their student fraternity. At the end of that century, the colours became those of the nation. In 1920, Estonia designed its flag in the same colours. The Estonian national anthem has a joint history with that of our northern neighbour, Finland. The tune for the two national anthems is identical and was written by Frederick Pacius, himself of German origin. The words originate with a leading figure in the Estonian national movement of around the turn of the 19th century, J. W. Jannsen. It is worth noting that during the Soviet occupation, the Estonian coat-of-arms, flag and national anthem were forbidden, and those using them were sentenced to long prison terms. The Estonian national flower is the cornflower. The Estonian national bird is the swallow. The Estonian national fish is the Baltic herring. The Estonian national stone is limestone.